A young apprentice, Okwudili Okoro, has given insight into why he murdered his brother and master, Azubuike Okoro and his wife, Jacinta Okoro, in a fit of rage when the couple were having their meal. On Saturday, Okwudili and his accomplice now at large, had barged into the home of his master, Azubuike, who also doubled as his blood brother, pulled two cutlasses hidden underneath their wears and hacked man and wife to death. Okwudili, who is in the police net, said he elected to kill his brother and wife because the man refused to settle him after completing the presumably agreed three years apprenticeship. It was learnt that he and his accomplice, Kenneth, fled the scene when their crime attracted the attention of residents, who raised the alarm but following a report of the incident by one Joseph Nwagu at the Sango Police Division in Ogun State, Okwudili was arrested. 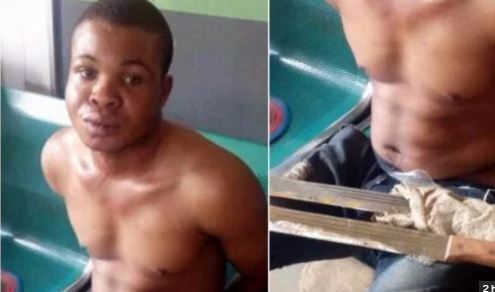 The Police Public Relations Officer (PPRO) in Ogun State, Abimbola Oyeyemi, who confirmed this in a statement, said the suspect claimed he killed his master for not settling him after serving for three years. Oyeyemi, a Deputy Superintendent of Police (DSP), added that the suspect was arrested when one Joseph Nwagu reported the crime to the police in Sango. According to the spokesman, Okwudili and Kenneth left their base in Sapon, Abeokuta, to commit the heinous crime at Ijako, three local government areas apart. “Upon the report, the DPO Sango Division, SP Nasirudeen Oyedele, led detectives to the scene where the suspect was arrested but his accomplice escaped. “On interrogation, the Ebonyi State-born suspect claimed to have served his deceased elder brother for three years, and when it was time for him to be settled, his brother kept on posting him from time to time. “He stated that when he realized that his brother was not ready to settle him, he contracted one Kenneth who is now on the run and they both bought two cutlasses, sharpened it to the edges and headed to his deceased elder brother’s house in Ijako. “On getting there, they met the deceased eating with his wife and before he would utter a word, they descended heavily on them with the sharp cutlasses and matcheted them to death. The two bodies have been taken to the general hospital Otta mortuary for post-mortem examination. According to him, the fleeing accomplice of the suspect would be apprehended and brought to book within the shortest possible time. Iliyasu also appealed to residents of the state not to take any threat to their lives lightly by reporting such to the police no matter who is involved.